Review Summary: Shahrukh Khan amazes, the rest of of the chase is more regular fare. Not to be missed for SRK fans.. Fan is proof that even if SRK isn't 25 years old, he certainly has the kind of enthusiasm that might put many 25-year-old actors to shame. Watch this one. Twice, if you are a SRK fan. You CAN'T MISS watching Shah Rukh Khan aka Gaurav in his darkest avatar ever! The movie had full potential to be among Shah Rukh Khan’s best films as an actor. Still, despite its flaws and failing to match up to the expectations level, it’s a must watch for all Shah Rukh Khan’s (the superstar and the actor) fans. FAN has a brilliant first half, but loses track in the second hour, only to pick up again towards the pre-climax. The character of Gaurav is the main center of attraction that can glue the audience in the theater. 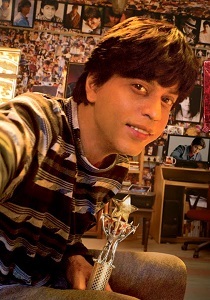 Shahrukh Khan Has Blown Us Away With His Obsessed 'Fan' Avatar! Keeping all the odds(Climax , few scenes) in the film with his legendary acting skills SRK makes this movie a worth watch. For all the promise it shows, “Fan” ends up as a disappointment for its unwillingness to explore the complicated, at times unfathomable relationship between an actor and his fans, and for reducing it to an average thriller. Shah Rukh Khan shines in double role, but his best is yet to come! Director Maneesh Sharma hasn’t given any filmi songs, just good performances and some questions for us to ponder. The A-list actor is back in form in Maneesh Sharma’s engaging thriller. Yet, ending with a Baazigar-esque twist, Fan makes you feel Darr all over again. Just when you thought Shah Rukh Khan is losing his edge, he makes a comeback. Just for these rare moments inspired by Shah Rukh Khan’s real life, you should go and watch Fan. He uploads the apology and feels, he has done great service to Aryan Khanna. Fan is implausible, unreasonable and unconvincing. And RJs don’t EVER speak the way they do in Hindi films, even if they are presenters in London. Argh. SRK Wins it all in this Gamble! Whether you are a fan or not, watch this one for a side of SRK you have never seen before. ‘Fan’ is overall a thrilling watch and reminds one of Shah Rukh’s old movies like ‘Darr’ and ‘Baazigar’. It feels like a tribute to King Khan but SRK hasn't been more unlike himself in any other film. So, should you invest in such a risky watch? If you're an SRK fan, you don't care for approval. But even if you aren't, this one's a thrilling watch. Shah Rukh Khan’s double role is highly engaging! ‘Fan’ — you can’t miss watching Shahrukh Khan AKA Gaurav in his darkest avatar ever! Shah Rukh Khan wins hearts in Maneesh Sharma’s fresh and intense flick! Make no mistake, this is Shah Rukh Khan’s BEST film in the last five years! Namrata Rao’s razor sharp edits are crisp and note-worthy. She aptly layers the visuals and Andrea Guerra’s background score to make the film a sound and visual delight. The movie “Fan” is a must watched movie for the SRK’s fans as SRK delivered a power full show stealing performances!!! Yes. For the acting masterclass in the end. Those 10 minutes are worth your money for the tickets. Every star who thinks he and she must mingle with the fans and "belong" with them must see this film. The film is taut and tense. And just when you think things could get predictable, you are shook by its madness. Fan is a gripping drama with SRK to propel it with his amazing energy. The first half is simply superb. A great watch. There is indeed a worthwhile triumph in just that. It's not unwatchable by any means and SRK fans will inevitably revel in it, but because it promised to be so different, it's hard not be a little underwhelmed.